I remember when I was at primary school me and my friends were always talking about the 2 new crazes that were out at the time. One was called Pokémon and the other was called Digimon. The 2 crazes were both similar in the way that both had Cartoons on CITV, both had Card Games, both had Video Games and both had Movies (the 2 also had the Mon in their names). It was not until about a year later when I started High School that I was asked which was better. Now at the time both were very good and it was harder to choose. Pokémon (short for Pocket Monsters) is a media Franchise owned by Nintendo about lots of monsters who go on adventures with people and have fights with other monsters. Digimon is a Media Franchise about lots of monsters living in a Digital World who go on adventures with people and have fights with other monsters. You can see that the 2 franchises are very similar. Now that I am older I can now compare them scientifically (not really) which is better. First off let’s take a look at the movies. Pokémon has released 13 movies where as Digimon has released just 9. However which of the 2 franchises had the best films. The answer is simple; Pokémon. The Digimon films had good storylines but the animation was not as good as the ones in the cartoons. However the Digimon Films (I have only seen the first one which was the first 3 into one movie, UK Release) were quite good and very enjoyable in my opinion Pokémon had much better films with good cast of characters, good storylines and it was the time when you had a chance of seeing the rare Pokémon. The best Film in the Pokémon movies is Pokémon 2000 (Pokémon 2). A great film with good pieces of music with some of the best Pokémon in the whole franchise like Lugia. Pokémon 1, Digimon 0. Now let’s take a look at the Card Games. The Pokémon card game was very well made, it was easy to get the hang of and there was lots of cards to collect, to this day you can still get Pokémon cards, okay they are not as easy to get hold of because it is not as big as it used to be but you can still get cards from shops like GAME and Gamestation. When you learned how to play the game it was easy to remember it and when you next played a game of it you could just set up your game with your friends and play it. The Digimon card game was not as popular (well not at least in the UK); I don’t remember being able to find it being sold or anywhere where you would even see it being sold. I remember seeing them in magazines but I don’t remember seeing them anywhere else. So for the fact that you could buy them as well as being able to play them this round goes to Pokémon. Pokémon 2, Digimon 0; now let’s take a look at the Video Games. Digimon released a few Video Games but were not as widely available as Pokémon Video Games. The 2 main Pokémon games at the time were the Hand Held games and Pokémon Stadium on the Nintendo 64. Both Pokémon Stadium 1 and Pokémon Stadium 2 were my favourite games on the Nintendo 64. I also played Pokémon Yellow on the Game Boy which was very interesting. With the recent Video Games being released for the DS and 3DS I would quite like to play the new Hand Held games because they do look like a lot of fun. I would also like to see both Pokémon Stadium 1 and 2 to arrive on the Nintendo Wii’s Virtual Console because I would really like to play them again. I did not manage to play any Digimon video game but from what I could see they look like more Better Graphics versions of Pokémon Hand Held Games, But I would still rather play Pokémon than Digimon even though I would still like to have a go at the Digimon Games. Pokémon 3, Digimon 0; Now it is the big one, The Cartoon Series, this is the real battleground between these 2 combatants. Digimon is the Better Cartoon Series. Pokémon had lots of episodes (okay it still has not finished) but it was fun and enjoyable, but Digimon had more of a story, well designed Characters and Digimon Monsters and good pieces of music. But the one major thing it has over Pokémon was the fact that it had a Beginning, Middle and End. OK Pokémon had all the other things except the ending. With Digimon it made it more exciting due to the point that it was going to end and you did not know when. The Characters defeated the big bad guy but then there was someone who was even more powerful than him and then it would all come to the point where they finally discover who the big bad guy is and defeat him and it would all be a happy ending. It was that point where it was the most exciting thing where it was the last episode and you tuned in to see what was going to happen and find out what the big finish was. You don’t get that with Pokémon because it doesn’t finish. With Digimon you get a real understanding of how it all pans out and how everything is connected and who was behind everything. The personalities of the villains was also particularly well done in particular Myotismon who was this vampire creature who had the style of a Count and when he got even more powerful he would get even more villainous. For characters to really shine in the Pokémon series they would have to appear in the films. I know that you may have different opinions about the 2 franchises and I am interested to find out which you think is better and why. In my opinion Digimon had the better cartoon series whereas Pokémon was better with the other things. Even though I have settled it for myself I think this debate will still go on for many years. It may have left the playgrounds and other things have taken its place, but for fans of both media franchises this debate may still go on for many years to come. Question: What is your Favourite Cartoon? Since I was young I have watched Cartoons, I remember so many. I remember when I first started to watch Pokémon back in 2000, I remember when Digimon came along soon after. I remember watching Card Captors on CITV after Pokémon and Digimon finished on the Channel. When I was in Hospital in 2006 I saw Ben10 for the first time. I remember when the X-Men Cartoon used to be shown on Live and Kicking. I also remember X-Men Evolution when it was on Up On The Roof on GMTV. It was also on Up On The Roof where I watched Transformers Armada as well as the remake cartoons of He-Man and TMNT (Teenage Mutant Ninja Turtles). I still watch cartoons to this day because I like watching them, particularly the ones with stories, stories that after so may episodes have an ending and that episode becomes so exciting to watch because you get to see how it ends and what happens. So what is my Favourite Cartoon. My Favourite cartoon was on Sunday Mornings for several weeks on CBBC and I loved it. It was called Wolverine and the X-Men. It was the story of an incident that occurred at the Xavier Institute and what happened afterwards. Professor Xavier went into a coma that would last for 20 years, meanwhile things are not going so well for the X-Men as a mutant registration act is about to come into force and the X-Men have all split up. So it is up to Wolverine to get everyone back together and save the world, and as this is happening 20 years into the future the world has changed and it is up to Professor Xavier to inform Wolverine in the past of what happened and how Wolverine needs to stop it from happening. 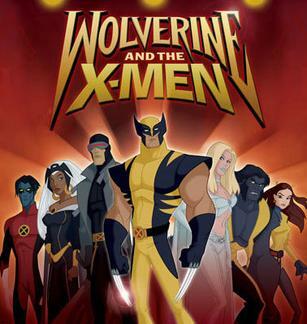 At first I was unsure about it when I first heard about it because the previous cartoon X-Men Evolution was Fantastic and is one of my favourite cartoons but after a few weeks of the show I liked Wolverine and the X-Men and soon after it finished it became my Favourite Cartoon series. I now have the whole series on DVD. The show went on for 26 episodes and covered many storylines which were part of the bigger story. Many Characters were introduced including some of my favourite characters like Angel, Wolverine and Bishop as well as my favourite X-Men character Gambit. Each Episode had its own story but these were small parts of the whole story, I like to think of it like 24 in the way that each episode has its own Story but is all part of one Big Story. However there are lots of online campaigns to save the show one of which is on FaceBook which I am part of (1 Million to save Wolverine and the X-Men). There were lots of reports before the cancellation was announced of new storylines and characters in the second series, but maybe one day another series may happen.